Updated 2/2/2018: It looks like Stuby Lathe USA is out of business. Thus you can no longer get the big gold drive center shown below. I suggest you get the “Elio-DR Safe Drive 2.5” from “Woodturning Tool Store” or the “Big Bite Chuck Spur” from Oneway. I like the looks of Elio better than the Big Bite, because you can adjust the dept of the points on the Elio. On the other hand the simplicity of just sticking the Oneway Big Bite into a Oneway Chuck really appeals to me. I DO NOT own either of these. Thus, I really don’t know. Here is a picture that shows the 3 different sizes of Elio-DR Safe Drives that are available on 2/2/2018. I would go with the 2.5″ model shown in the center. I would probably also purchase the Drawbar Kit for Elio-DR. Then never use it because I don’t want to spend time removing the Oneway Vacuum Adapter from the headstock of my lathe. Here is a picture that shows the Oneway Big Bit Chuck Spur on 2/2/2018. Updated 10/3/2016: Change Stuby Lathe USA web address from http://stubbylatheusa.com/Online_Store/DriveCenterFlyer.pdf to http://praxislathe.com/slusa/lep/pages/products/other-accessories.php. I don’t really understand what is going on here and I am a bit dubious. I was watching a woodturning video this morning. I agreed with the video when it mentioned that a 2 prong drive center works better than a 4 prong drive center on bowl blanks. But, once again, I was not impressed by there wimpy little drive center. Why? Because I have one of these. It is made by Stuby Lathe USA. I love this drive center because you can just screw it on to the headstock and you can remove 2 of the prongs. Thus, it can be used as a 2 prong or 4 prong drive center. I always use just 2 prongs. The center point can be adjusted in/out. The prongs are deep so you can really sink them into a log. 2″ wide is just the right size for rough bowl blanks. Not to small and not to wide. It is the best drive center for bowls in my not so humble opinion. I now use this center for all of my bowls when I start off by mounting a log between centers. 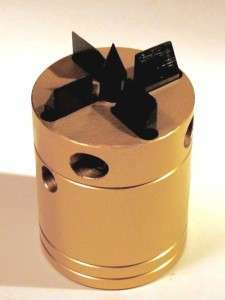 The only other center that comes close to the above center is the Oneway Big Bite Chuck Spur. It is ok. But I like the above one better. The spurs on the big bite are to far apart. Thus it is often hard get both spurs to engage on a round log surface when making a natural edge bowl. 2 prong centers should always be used with the prongs across the grain (rather than with the grain) to avoid splitting a blank. I own other drive centers. 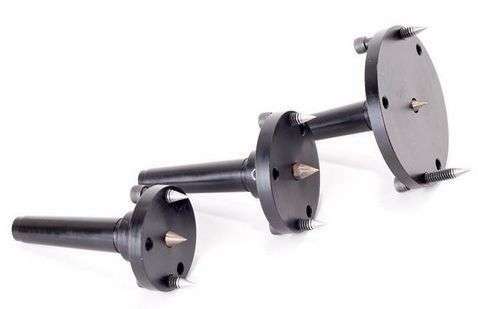 Jumbo and standard size 2 and 4 prong drive centers. Steb centers, etc. 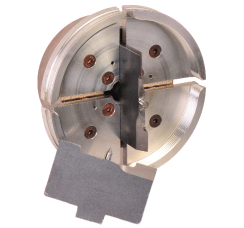 I like to use a 1/2″ or 1″ steb center for spindle turning. The $20 steb centers work fine.